Introduction: The effect of low-level laser therapy (LLLT) on wound healing has been evaluated in several studies; however, little is known about the molecular mechanisms that underlies the biostimulatory effect of this treatment modality. Aim: to evaluate the effect of LLLT on gene expression of vascular endothelial growth factor (VEGF) and interleukin-1beta (IL-1 b) during healing of wounds created by surgical blade and by surgical laser in order to have a better image of their interactive role influenced by the laser irradiation. Materials and Methods: 40 male Wister rats were randomly assigned into four groups (A, B, C and D). In groups A and C, an incision was made in the gingival and mucosal tissues using a surgical scalpel. A similar incision was made in groups B and D using 980 nm diode laser. Group A and B were subjected twice to low level 870 nm diode laser 3 h and 24 h after the incision while group C and D served as controls. 30 min after the second irradiation, the rats belonging to all groups were euthanized, and the wound area was excised. Quantitative reverse-transcriptasepolymerase chain reaction was used to measure the gene expression of VEGF and IL-1b. Results and Discussion: LLLT caused an increase in VEGF gene expression in scalpel-induced wounds and a corresponding decrease in laser-induced wounds but without significant differences. LLLT inhibited the gene expression of IL-1b in both types of wounds, but this inhibition was only significant in scalpel wounds. Conclusion: Biostimulatory effect of LLLT could be mediated through modulation of the immune response by the inhibition of IL-1b. Since cytokines and growth factors have important roles in the regulation of different stages of repair process, the purpose of this study was to evaluate the effect of low-level diode laser on gene expression of VEGF and IL-1 b, during healing of wounds created by surgical blade and by surgical laser. This can improve our understanding of their interactive role influenced by the laser irradiation in wound healing. This study was conducted in compliance with medical research ethical committee, National Research Centre, Egypt (Ethics Registration Number 09/107). Totally, 40 healthy male Wistar rats with weight ranging from 400 to 450 g were obtained from the Animal House, National Research Centre. The rats were randomly assigned into four groups; group A, B, C, and D (n = 10 for each group). Group A, and B are the case groups while group C, and D are the controls. The rats were anesthetized with diethyl ether. 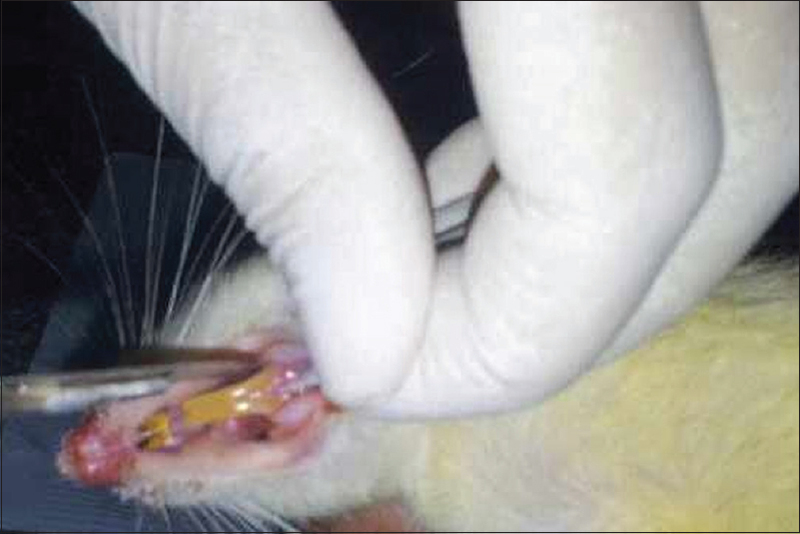 An incision was made on the gingival and mucosal tissues of the labial surface of mandibular incisors in each rat, 2 mm deep and 5 mm in length. The incision was created using No. 15 surgical blade in groups A and C. while in groups B, and D, it was made using 980 nm diode surgical laser [Figure 1] and [Figure 2]. 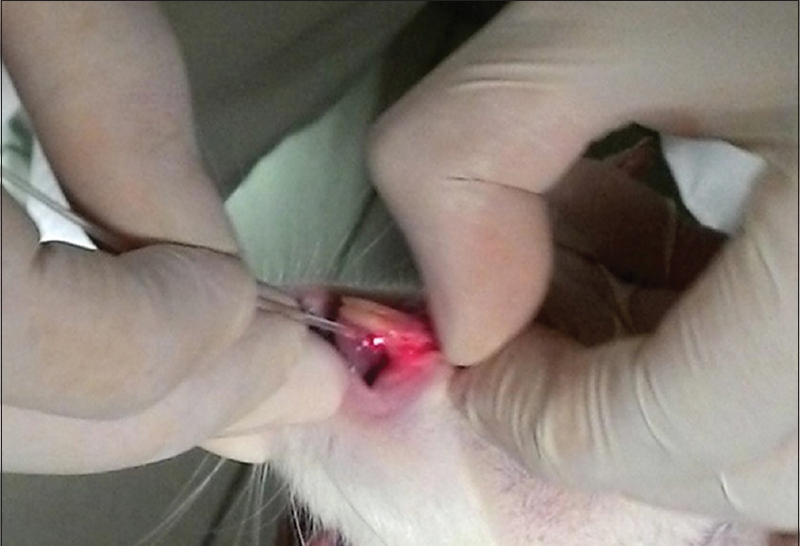 Three hours after incision, the rats in group A and B were sedated again, and the wounds were exposed to low power diode laser irradiation [Figure 3]. The rats of the control group C and D did not receive low power laser irradiation. Twenty-four hours after primary incision, the rats in group A and B were irradiated for the second time with the same procedure. 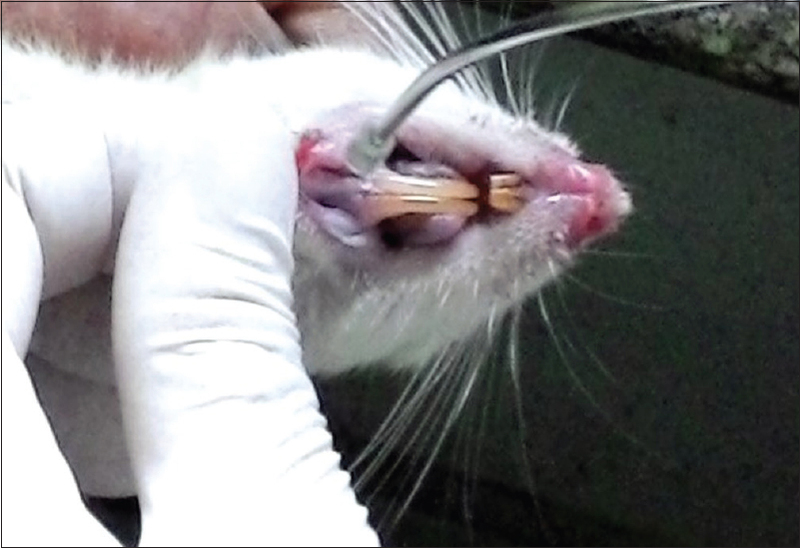 Thirty minutes after completion of the laser therapy, the rats belonging to all groups were then euthanized with the appropriate dose of diethyl ether. Excisional biopsy was taken from the site of the incision, and the excised tissues were snap frozen in liquid nitrogen and stored at −80°C. The incisions in group B and D were made using diode laser (Quanta C, Italy) with wavelength of 980 nm. The laser was set in a continuous wave (CW) mode at a power output of 2.5 W with a 320 mm diameter fiber tip, and it was operated in contact mode. Low-power laser irradiation in groups A, and B were performed using a diode laser (Soft-Laser SL-202, Petrolaser, Russia) with wavelength of 870 nm in CW mode. The total irradiation time was 120 s with power output of 80 mW with energy density of 9.6 J/cm 2 , delivered through K30 tip type, which has 0.03 cm 2 irradiance surface in noncontact mode at a distance 0.5 cm. RNA extraction was carried out using Qiagen RNeasy ® mini kit following the manufacturer's protocol. This was, followed by determination of quality and quantity of RNA using NanoDrop 2000 Spectrophotometer (NanoDrop Technologies, USA). Synthesis of single-stranded cDNA was carried out using High Capacity cDNA Reverse Transcription Kit (Applied Biosystems). One microgram of total RNA was reverse transcribed into 20 ml cDNA. Real-time polymerase chain reaction (PCR) reactions were performed in StepOne Real-Time PCR System (Applied Biosystems, USA). The sequence of Forward (F) and reverse (R) primers purchased from Invitrogen are listed in [Table 1]. b-actin was used as a constitutively expressed gene product for comparison of cytokines and growth factors' mRNA abundance between samples. Thermocycling was done in a final volume of 25 ml (8 ml DEPC H 2 O, 2.5 ml cDNA, 1 ml of 10 pM Forward and reverse primers, and 12.5 ml of The QuantiTect SYBR ® Green Master Mix) using the following PCR conditions: For b-actin, and VEGF: The thermocycler was run for 1 cycle (95°C for 10 min), 45 cycles (95°C for 15 s, 60°C for 1 min) and 1 cycle (95°C for 15 s, 60°C for 1 min). For Il-1 b: 1 cycle (95°C for 10 min), 45 cycles (95°C for 15 s, 55°C for 1 min) and 1 cycle (95°C for 15 s, 60°C for 1 min). The values of mean, standard deviation, standard error of the mean were calculated using the SPSS 18 software (The manufacturer details of SPSS 18 Software is (SPSS Inc., Chicago, IL, USA). The obtained data were tested for normality using Kolmogorov-Smirnov test of normality. The one way ANOVA (parametric test) was used when the data were normally distributed, while, the Kruskal-Wallis test (nonparametric tests) was used for the comparisons of means between groups when data were not normally distributed. Whenever the result of the ANOVA or Kruskal-Wallis test was significant it was, followed by a Tukey HSD tests for pair-wise comparisons among groups. Differences were considered statistically significant if the P < 0.05 [Figure 3]. To assess the differences in cytokine mRNA expression between different groups, b-actin was used as a reference house-keeping gene and cytokine mRNA levels were normalized to b-actin. 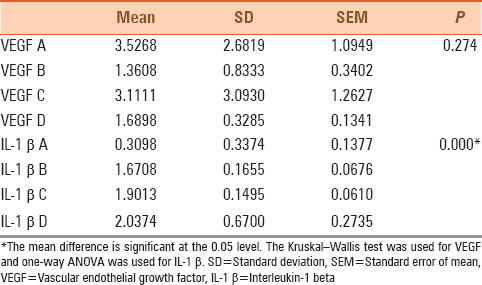 Kruskal-Wallis test was used for the comparisons of means of VEGF between groups as the data were not normally distributed whereas one-way ANOVA was used for IL-1 b (normally distributed data) [Table 2]. 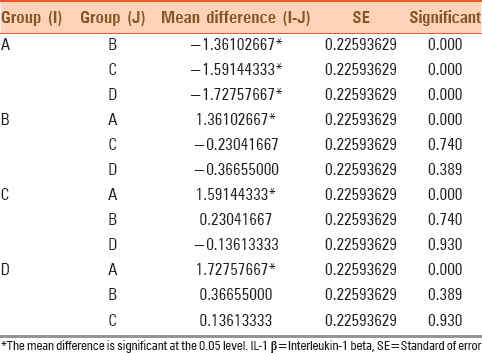 The comparison among the IL-1 b groups turned out to be highly significant with P = 0.000. The results of the pair-wise comparisons revealed that the cause of significance was (group A) [Table 3]. Laser irradiation of incisions created with a scalpel caused an increase in gene expression of VEGF as (group A) showed higher expression of VEGF than (group C). However, this increase was nonsignificant. There was a nonsignificant decrease in (group B) which received LLLT when compared with the control group (D) which did not receive LLLT. When comparing (group B [laser-incision and LLLT]) with (group C [Scalpel incision with no LLLT]), there was a decrease in VEGF expression. This decrease was statistically nonsignificant [Figure 4]. Laser phototherapy caused marked inhibition of IL-1 b expression and the decrease in mRNA level in (group A) was highly significant in comparison with (group C). Although there was a decrease in mRNA levels of IL-1 b in laser-induced wounds submitted to LLLT (group B) in relation to (group D [laser incision without LLLT]), this decrease was not statistically significant. 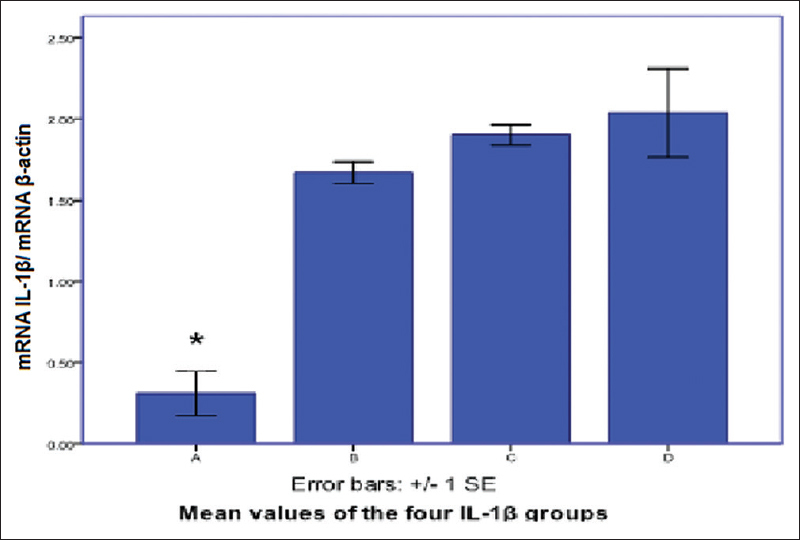 Gene expression of IL-1 b in (group B [laser incision and LLLT]) was slightly lower than that of (group C [scalpel incision and no LLLT]) but without significant difference [Figure 5]. Whereas the laser therapy plays an important role during tissue repair, the biological mechanisms involved to this phenomenon are not completely elucidated. Because VEGF and IL-1 b are important mediators in wound healing, the study of changes in their expressions provides a valuable mean to study the effect of LLLT on the healing process. As surgical laser wounds involve a different healing pattern due to thermal damage, presence of necrotic zone, greater inflammatory reaction and delayed epithelialization, ,, we extend our research of biostimulatory effect of LLLT to include both scalpel and laser induced surgical wounds. Several studies reported stimulatory effect of LLLT on VEGF expression. Enhanced expression of VEGF in cultured gingival fibroblast, when subjected to LLLT were found by Basso et al. and Hakki and Bozkurt. Similarly, irradiation of cultured endothelial cells with low-level laser caused upregulation of VEGF expression. Lee et al. examined the effect of the drug alendronate on oral keratinocytes and the effect of LLLT on alendronate-treated keratinocytes. Alendronate was found to inhibit the keratinocyte viability and suppress its expression of VEGF resulting in defective wound healing. Irradiation of alendronate-treated keratinocytes with LLLT increased their expression of VEGF. They suggested that LLLT could be used to partially overcome the inhibitory effects of this drug on mucosal wound healing. On the other hand, the inhibitory effect of LLLT on VEGF expression was reported by Silva et al. who compared the gene expression of VEGF in three groups of rats; the first group: Nonoperated animals, the second group: Operated animals in which a surgical wound was induced in the tongue and the third group operated animals subjected to 780 nm diode laser (70 mW, 35 J/cm 2 ). 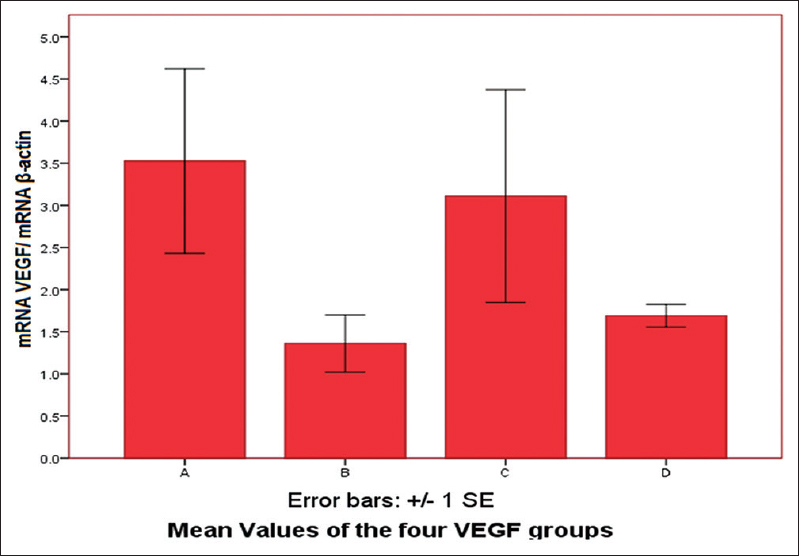 One day after surgery, the trauma-induced by the surgical wound in the second group caused an elevation in VEGF expression when compared to the nonoperated first group. Exposure of the surgical wounds in the third group to LLLT reduced the level of VEGF when compared to the second groups and returned it to levels comparable to the first nonoperated group. These authors used relatively high energy density (35 J/cm 2 ) in contrast to 9.6 J/cm 2 energy density used in our study, which could explain the contradictory results. This assumption is supported by the finding reported by Kipshidze et al. that high energies of low-level laser were cytotoxic to vascular cells. In the current study, analysis of VEGF expression did not reveal statistically significant difference among different groups. When we measured the gene expression of pro-inflammatory cytokine IL-1 b, we found that LLLT markedly inhibited its expression in scalpel-induced wounds. Our results are in accordance with several studied which showed inhibitory effect of LLLT on IL-1 b expression. Reduction in IL-1 b expression was noted in cultures of smooth muscle cells,  gingival fibroblasts  , as well as normal, wounded and diabetic skin fibroblasts. Safavi et al. and Lima et al. reported that laser irradiation inhibited IL-1 b expression in experimental surgical wounds in rats. Viegas et al. compared the anti-inflammatory effect of two types of laser (685 and 830 nm) on the IL-1 b mRNA levels in rats' surgical wounds with the anti-inflammatory drug Meloxicam. The Meloxicam treated group significantly inhibited IL-1 b expression. While the irradiated animals did not show results similar to those of the group that received meloxicam, the levels of IL-1 b mRNA expression detected in the irradiated animals was lower than that of the control group. de Almeida et al. compared the anti-inflammatory effect of sodium diclofenac (topical application), cryotherapy, and LLLT on pro-inflammatory cytokine levels after a controlled model of muscle injury. Only LLLT of the three treatment modalities reduced IL-1 b expression to a significant level when compared to the controls. Wu et al. investigated the anti-inflammatory effect of LLLT on human adipose-derived stem cells in an inflammatory environment. Lipopolysaccharide treatment of the cells strongly induced the expression of pro-inflammatory genes including IL-1 b. However, when the cells were treated with a combination of LLLT and lipopolysaccharide, the mRNA levels of IL-1 b were dramatically decreased. Alves et al. exposed experimental rats with osteoarthritis to low power 880 nm diode laser. There was a reduction in IL-1 b mRNA expression in articular synovial lavage to values obtained in the control group (rats without osteoarthritis). LLLT has been shown to promote a decrease in mRNA expression of IL-1 b in rats' paw muscle in which inflammation was induced through the injection with carrageenan. Yang et al. studied the possible role of LLLT on counteracting the inflammatory effect of amyloid b-peptides on astrocytes, which is thought to mediate the progression of Alzheimer's disease. Western blot analyses of IL-1 b showed that stimulation of astrocytes by amyloid b-peptides led to a significant increase in the expressions of IL-1 b, while laser pretreatment suppressed the expressions to the control level. Under the conditions of this study, we can conclude that LLLT has a positive effect on attenuating the inflammatory response in scalpel-induced wounds. This modulation of the immune response may be responsible for the biostimulatory effect of laser therapy. The authors would like to acknowledge the National Research Center and the National Institute of Laser Enhanced Sciences for providing access to the equipment by which the experiments were conducted. The authors thank Ms. Phoebe Magdy Abd El-Massieh for her effort in statistical data analysis. Riedel K, Riedel F, Goessler UR, Holle G, Germann G, Sauerbier M. Current status of genetic modulation of growth factors in wound repair. Int J Mol Med 2006;17:183-93. Fitzpatrick RE. Endogenous growth factors as cosmeceuticals. Dermatol Surg 2005;31:827-31. Kapoor M, Nomiyama T, Bruemmer D, Kojima F, Crofford LJ. Growth factors and cytokines: Emphasis on their role in wound healing and atherosclerosis. Curr Anaesth Crit Care 2006;17:13-20. Werner S, Grose R. Regulation of wound healing by growth factors and cytokines. Physiol Rev 2003;83:835-70. Tang X, Yang Y, Yuan H, You J, Burkatovskaya M, Amar S. Novel transcriptional regulation of VEGF in inflammatory processes. J Cell Mol Med 2013;17:386-97. Kajdaniuk D, Marek B, Borgiel-Marek H, Kos-Kudla B. Vascular endothelial growth factor (VEGF)-part 1: In physiology and pathophysiology. Endokrynol Pol 2011;62:444-55. Nogami M, Hoshi T, Kinoshita M, Arai T, Takama M, Takahashi I Vascular endothelial growth factor expression in rat skin incision wound. Med Mol Morphol 2007;40:82-7. Bao P, Kodra A, Tomic-Canic M, Golinko MS, Ehrlich HP, Brem H. The role of vascular endothelial growth factor in wound healing. J Surg Res 2009;153:347-58. Sandulache VC, Chafin JB, Li-Korotky HS, Otteson TD, Dohar JE, Hebda PA. Elucidating the role of interleukin 1beta and prostaglandin E2 in upper airway mucosal wound healing. Arch Otolaryngol Head Neck Surg 2007;133:365-74. Barrientos S, Stojadinovic O, Golinko MS, Brem H, Tomic-Canic M. Growth factors and cytokines in wound healing. Wound Repair Regen 2008;16:585-601. Pollinger HS, Mostafa G, Harold KL, Austin CE, Kercher KW, Matthews BD. Comparison of wound-healing characteristics with feedback circuit electrosurgical generators in a porcine model. Am Surg 2003;69:1054-60. Moshkovska T, Mayberry J. It is time to test low level laser therapy in Great Britain. Postgrad Med J 2005;81:436-41. Saygun I, Karacay S, Serdar M, Ural AU, Sencimen M, Kurtis B. Effects of laser irradiation on the release of basic fibroblast growth factor (bFGF), insulin like growth factor-1 (IGF-1), and receptor of IGF-1 (IGFBP3) from gingival fibroblasts. Lasers Med Sci 2008;23:211-5. Romanos G, Nentwig GH. Diode laser (980 nm) in oral and maxillofacial surgical procedures: Clinical observations based on clinical applications. J Clin Laser Med Surg 1999;17:193-7. Mendez TM, Pinheiro AL, Pacheco MT, Nascimento PM, Ramalho LM. Dose and wavelength of laser light have influence on the repair of cutaneous wounds. J Clin Laser Med Surg 2004;22:19-25. Santos NR, dos Santos JN, dos Reis JA Jr, Oliveira PC, de Sousa AP, de Carvalho CM, et al. Influence of the use of laser phototherapy (lambda 660 or 790 nm) on the survival of cutaneous flaps on diabetic rats. Photomed Laser Surg 2010;28:483-8. Johnson MA, Gadacz TR, Pfeifer EA, Given KS, Gao X. Comparison of CO2 laser, electrocautery, and scalpel incisions on acute-phase reactants in rat skin. Am Surg 1997;63:13-6. D'Arcangelo C, Di Nardo Di Maio F, Prosperi GD, Conte E, Baldi M, Caputi S. A preliminary study of healing of diode laser versus scalpel incisions in rat oral tissue: A comparison of clinical, histological, and immunohistochemical results. Oral Surg Oral Med Oral Pathol Oral Radiol Endod 2007;103:764-73. Basso FG, Pansani TN, Turrioni AP, Bagnato VS, Hebling J, de Souza Costa CA. In vitro wound healing improvement by low-level laser therapy application in cultured gingival fibroblasts. Int J Dent 2012;2012:719452. Hakki SS, Bozkurt SB. Effects of different setting of diode laser on the mRNA expression of growth factors and type I collagen of human gingival fibroblasts. Lasers Med Sci 2012;27:325-31. Feng J, Zhang Y, Xing D. Low-power laser irradiation (LPLI) promotes VEGF expression and vascular endothelial cell proliferation through the activation of ERK/Sp1 pathway. Cell Signal 2012;24:1116-25. Lee JY, Kim IR, Park BS, Kim YD, Chung IK, Song JM, et al. Effect of low-level laser therapy on oral keratinocytes exposed to bisphosphonate. Lasers Med Sci 2015;30:635-43. Pereira MC, de Pinho CB, Medrado AR, Andrade Zde A, Reis SR. Influence of 670 nm low-level laser therapy on mast cells and vascular response of cutaneous injuries. J Photochem Photobiol B 2010;98:188-92. Cury V, Moretti AI, Assis L, Bossini P, Crusca Jde S, Neto CB, et al. Low level laser therapy increases angiogenesis in a model of ischemic skin flap in rats mediated by VEGF, HIF-1a and MMP-2. J Photochem Photobiol B 2013;125:164-70. Dias FJ, Issa JP, Barbosa AP, de Vasconcelos PB, Watanabe IS, Mizusakiiyomasa M. Effects of low-level laser irradiation in ultrastructural morphology, and immunoexpression of VEGF and VEGFR-2 of rat masseter muscle. Micron 2012;43:237-44. Silva TC, Oliveira TM, Sakai VT, Dionísio TJ, Santos CF, Bagnato VS, et al. In vivo effects on the expression of vascular endothelial growth factor-A165 messenger ribonucleic acid of an infrared diode laser associated or not with a visible red diode laser. Photomed Laser Surg 2010;28:63-8. Kipshidze N, Nikolaychik V, Keelan MH, Shankar LR, Khanna A, Kornowski R, et al. Low-power helium: Neon laser irradiation enhances production of vascular endothelial growth factor and promotes growth of endothelial cells in vitro. Lasers Surg Med 2001;28:355-64. Gavish L, Perez L, Gertz SD. Low-level laser irradiation modulates matrix metalloproteinase activity and gene expression in porcine aortic smooth muscle cells. Lasers Surg Med 2006;38:779-86. Nomura K, Yamaguchi M, Abiko Y. Inhibition of interleukin-1beta production and gene expression in human gingival fibroblasts by low-energy laser irradiation. Lasers Med Sci 2001;16:218-23. Houreld NN, Sekhejane PR, Abrahamse H. Irradiation at 830 nm stimulates nitric oxide production and inhibits pro-inflammatory cytokines in diabetic wounded fibroblast cells. Lasers Surg Med 2010;42:494-502. Safavi SM, Kazemi B, Esmaeili M, Fallah A, Modarresi A, Mir M. Effects of low-level He-Ne laser irradiation on the gene expression of IL-1beta, TNF-alpha, IFN-gamma, TGF-beta, bFGF, and PDGF in rat's gingiva. Lasers Med Sci 2008;23:331-5. Lima AA, Spínola LG, Baccan G, Correia K, Oliva M, Vasconcelos JF, et al. Evaluation of corticosterone and IL-1ß, IL-6, IL-10 and TNF-a expression after 670-nm laser photobiomodulation in rats. Lasers Med Sci 2014;29:709-15. Viegas VN, Abreu ME, Viezzer C, Machado DC, Filho MS, Silva DN, et al. Effect of low-level laser therapy on inflammatory reactions during wound healing: Comparison with meloxicam. Photomed Laser Surg 2007;25:467-73.
de Almeida P, Tomazoni SS, Frigo L, de Carvalho Pde T, Vanin AA, Santos LA, et al. What is the best treatment to decrease pro-inflammatory cytokine release in acute skeletal muscle injury induced by trauma in rats: Low-level laser therapy, diclofenac, or cryotherapy? Lasers Med Sci 2014;29:653-8. Yamaura M, Yao M, Yaroslavsky I, Cohen R, Smotrich M, Kochevar IE Low level light effects on inflammatory cytokine production by rheumatoid arthritis synoviocytes. Lasers Surg Med 2009;41:282-90. Aimbire F, Ligeiro de Oliveira AP, Albertini R, Corrêa JC, Ladeira de Campos CB, Lyon JP, et al. Low Level Laser Therapy (LLLT) decreases pulmonary microvascular leakage, neutrophil influx and IL-1 b levels in airway and lung from rat subjected to LPS-induced inflammation. Inflammation 2008;31:189-97. Mafra de Lima F, Villaverde AB, Salgado MA, Castro-Faria-Neto HC, Munin E, Albertini R, et al. Low intensity laser therapy (LILT) in vivo acts on the neutrophils recruitment and chemokines/cytokines levels in a model of acute pulmonary inflammation induced by aerosol of lipopolysaccharide from Escherichia coli in rat. J Photochem Photobiol B 2010;101:271-8. Wu JY, Chen CH, Wang CZ, Ho ML, Yeh ML, Wang YH. Low-power laser irradiation suppresses inflammatory response of human adipose-derived stem cells by modulating intracellular cyclic AMP level and NF-kB activity. PLoS One 2013;8:e54067. Alves AC, Vieira R, Leal-Junior E, dos Santos S, Ligeiro AP, Albertini R, et al. Effect of low-level laser therapy on the expression of inflammatory mediators and on neutrophils and macrophages in acute joint inflammation. Arthritis Res Ther 2013;15:R116. Albertini R, Villaverde AB, Aimbire F, Bjordal J, Brugnera A, Mittmann J, et al. Cytokine mRNA expression is decreased in the subplantar muscle of rat paw subjected to carrageenan-induced inflammation after low-level laser therapy. Photomed Laser Surg 2008;26:19-24. Yang X, Askarova S, Sheng W, Chen JK, Sun AY, Sun GY, et al. Low energy laser light (632.8 nm) suppresses amyloid-ß peptide-induced oxidative and inflammatory responses in astrocytes. Neuroscience 2010;171:859-68. Wilder-Smith P. Dental laser application: Periodontal treatment and intra-oral surgery. In: Berlien HP, Müller GJ, editors. Applied Laser Medicine. 1 st ed. New York: Springer; 2003. p. 317-22.